It was a cold, icy, snowy New York City winter and Charlene Cruse-Rivera’s kindergarten children at P.S. 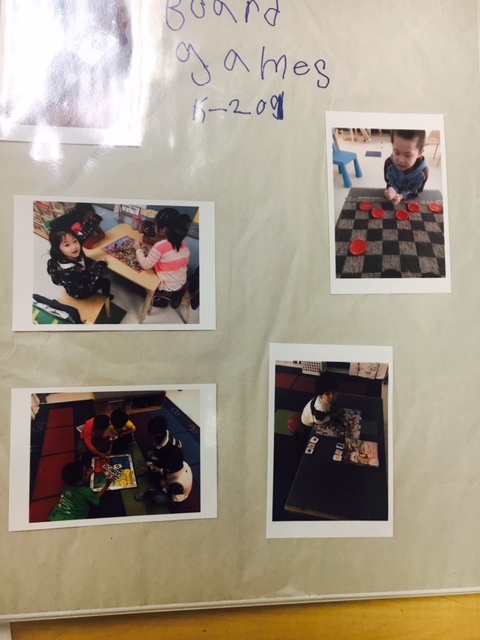 244 in Flushing, Queens were not getting outside often to explore the neighborhood outside the school. 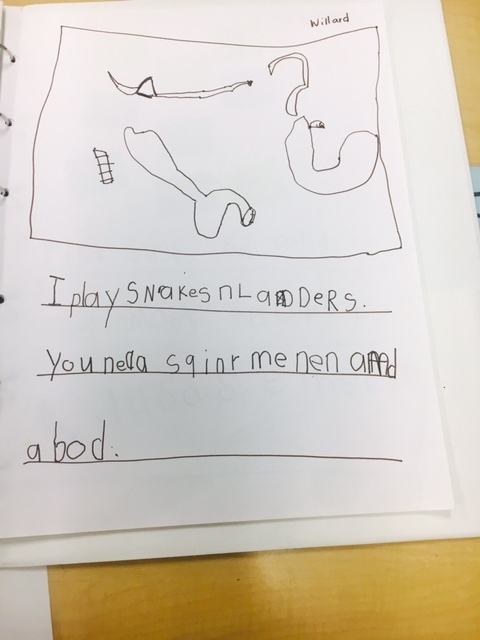 Earlier in the year they spent a lot of time visiting and playing in a variety of playgrounds as part of their playground inquiry project. What to explore now that it wasn’t as practical to spend much time outside of the school building? Being a good observer of children, Charlene noticed that a group of the children liked to play board games. She and I discussed this interest and came up with some ideas together. Perhaps it might be opportune to plunge into an in-depth study of board games with the entire class. Would they find this interesting? 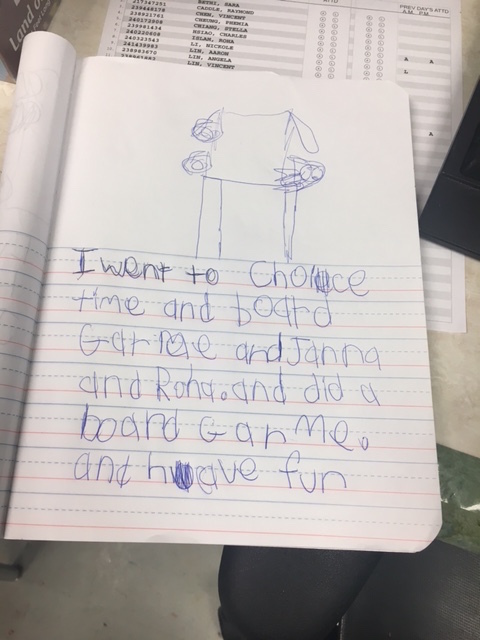 Charlene shared her observations with the class and asked them if they would like to spend a week exploring different board games. They seemed interested and so she had one period each day when children got into groups to play a chosen board game. 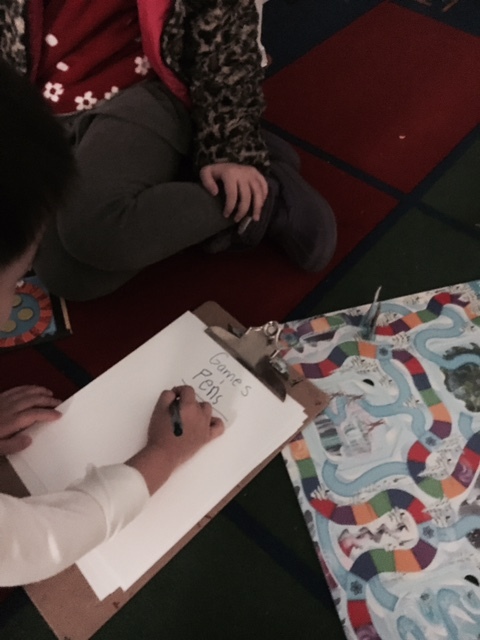 Rather than introduce many games, she had doubles of games so that, for example, each day two groups of children could play Candyland, two could play Checkers, two played Snakes and Ladders, etc. After playing the games, they discussed their discoveries and observations at the class meeting. 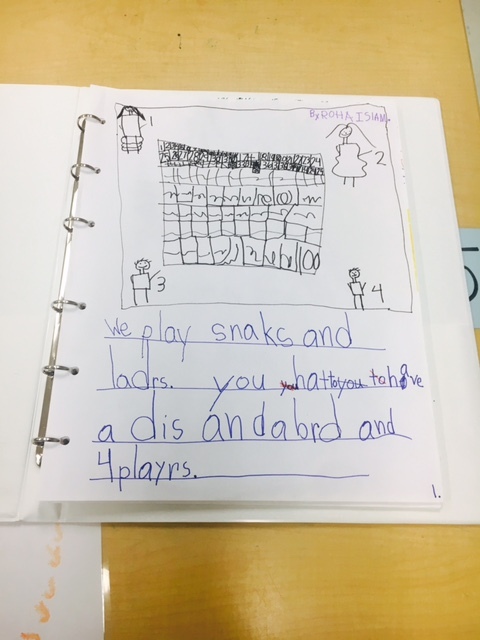 Charlene introduced a book where children could write about the different games that they played. 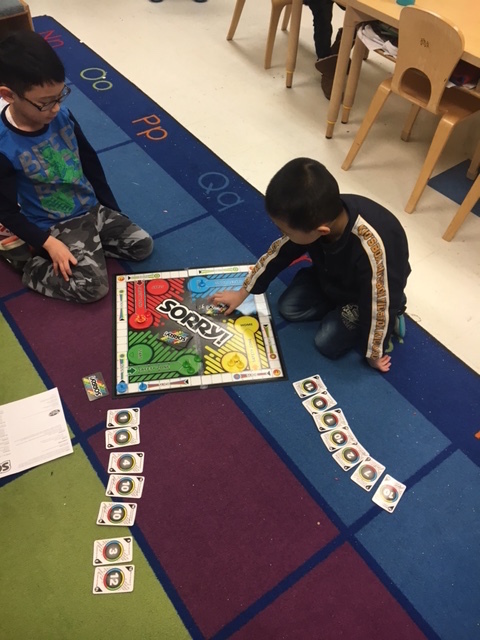 After the week of being immersed in board games, two Choice Time centers were opened. At one center, children could play commercial board games. The second center was one where children could create their own, original games, introduce the games to the class and add them to the game center. 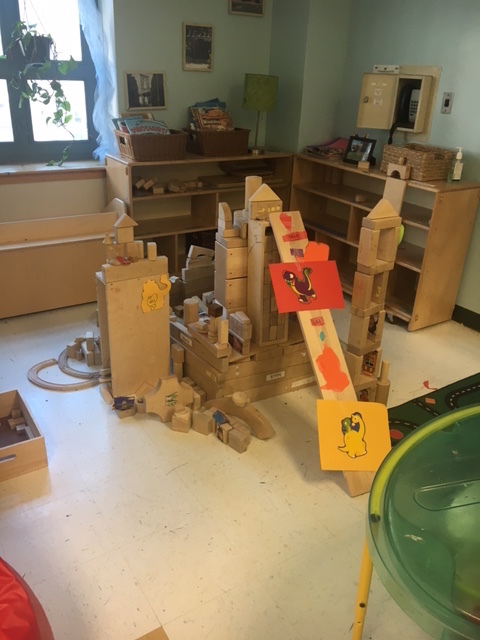 The enthusiasm here built up and even spread to the block center where a group of children created a Dinosaur Game from a block construction. • Children gain an understanding of greater than and less than. 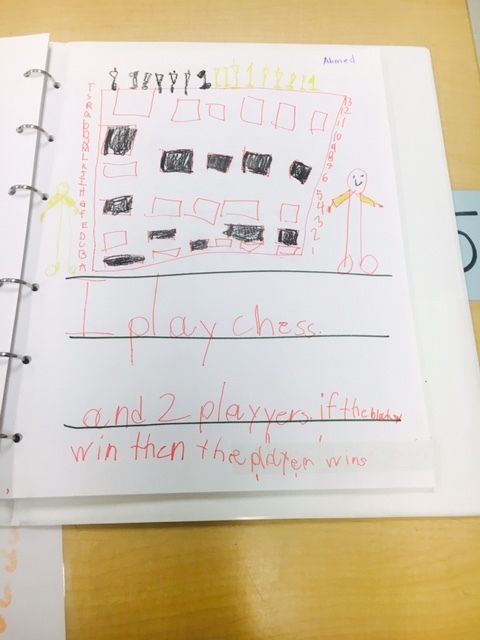 • Children learn the importance of careful strategizing. 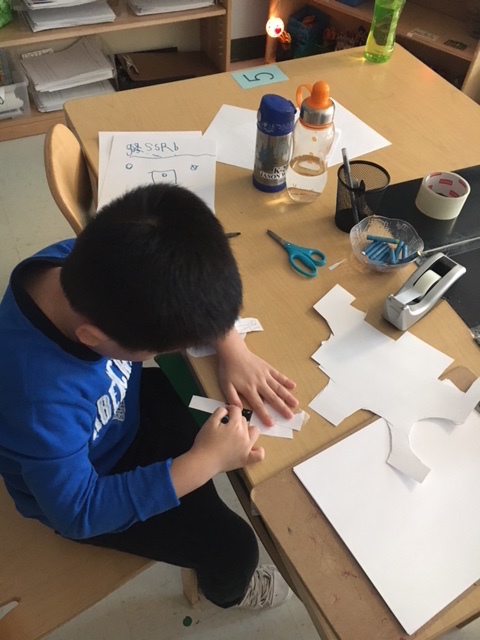 • When children create their own games, they draw on their knowledge of basic game attributes and then have opportunities to creatively improvise. 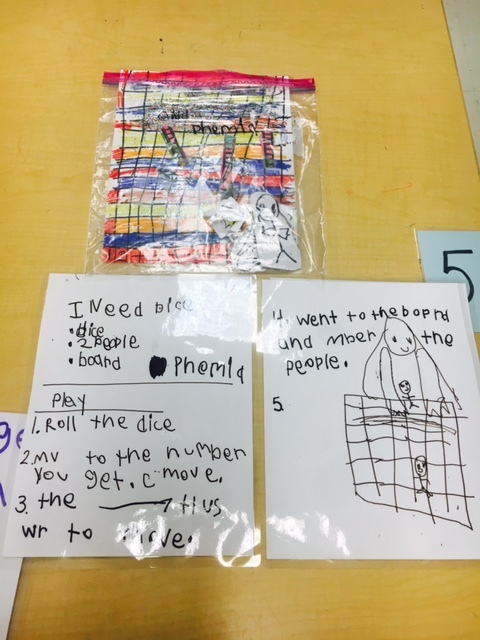 • In creating their own games, children might decide to make up a game that’s based on a favorite storybook, thereby making some important literacy connections. • Playing a board game is a social activity. 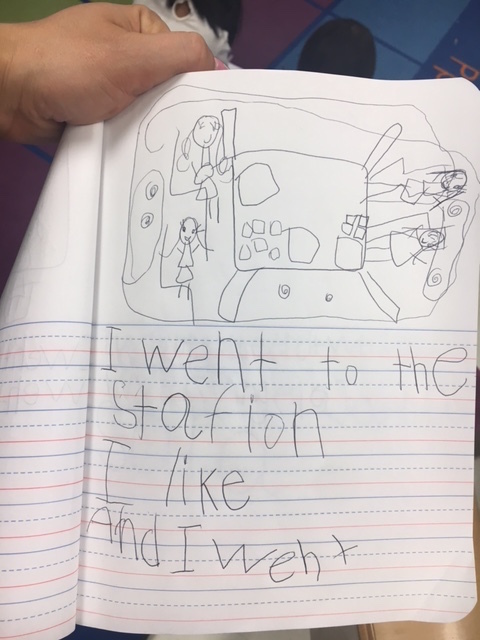 This entry was posted in Investigating Choice Time: Inquiry, Exploration, and Play on April 21, 2017 by Renee. This article, from the Sunday, April 2, 2017 edition of the New York Times, spotlights the importance of believing and investing in all children. If you haven’t read it already, I hope you take the time to read it now. Who Needs Charters When You Have Public Schools Like These? “Let me show you my notebook where I wrote the algorithm. 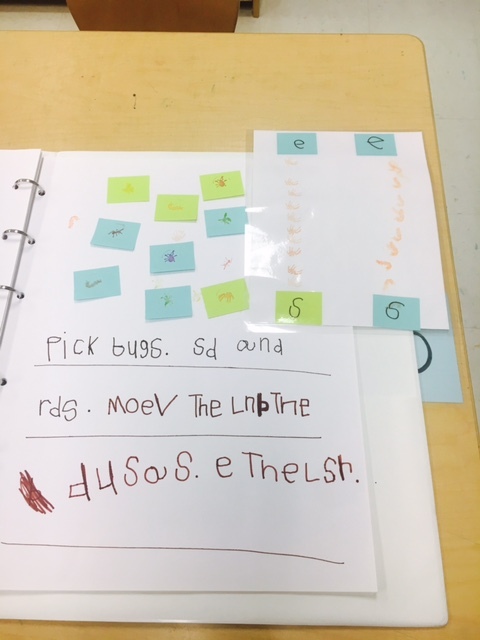 An algorithm is like a recipe,” Leila, one of the students in the class, explained to the school official who described the scene to me. You might assume these were gifted students at an elite school. Instead they were 7-year-olds, second graders in the Union Public Schools district in the eastern part of Tulsa, Okla., where more than a third of the students are Latino, many of them English language learners, and 70 percent receive free or reduced-price lunch. From kindergarten through high school, they get a state-of-the-art education in science, technology, engineering and math, the STEM subjects. When they’re in high school, these students will design web pages and mobile apps, as well as tackle cybersecurity and artificial intelligence projects. And STEM-for-all is only one of the eye-opening opportunities in this district of around 16,000 students. Betsy DeVos, book your plane ticket now. Ms. DeVos, the new secretary of education, dismisses public schools as too slow-moving and difficult to reform. She’s calling for the expansion of supposedly nimbler charters and vouchers that enable parents to send their children to private or parochial schools. But Union shows what can be achieved when a public school system takes the time to invest in a culture of high expectations, recruit top-flight professionals and develop ties between schools and the community. Union has accomplished all this despite operating on a miserly budget. Oklahoma has the dubious distinction of being first in the nation in cutting funds for education, three years running, and Union spends just $7,605 a year in state and local funds on each student. That’s about a third less than the national average; New York State spends three times more. Although contributions from the community modestly augment the budget, a Union teacher with two decades’ experience and a doctorate earns less than $50,000. Her counterpart in Scarsdale, N.Y., earns more than $120,000. This individual attention has paid off, as Union has defied the demographic odds. In 2016, the district had a high school graduation rate of 89 percent — 15 percentage points more than in 2007, when the community was wealthier, and 7 percentage points higher than the national average. The school district also realized, as Ms. Burden put it, that “focusing entirely on academics wasn’t enough, especially for poor kids.” Beginning in 2004, Union started revamping its schools into what are generally known as community schools. These schools open early, so parents can drop off their kids on their way to work, and stay open late and during summers. They offer students the cornucopia of activities — art, music, science, sports, tutoring — that middle-class families routinely provide. They operate as neighborhood hubs, providing families with access to a health care clinic in the school or nearby; connecting parents to job-training opportunities; delivering clothing, food, furniture and bikes; and enabling teenage mothers to graduate by offering day care for their infants. 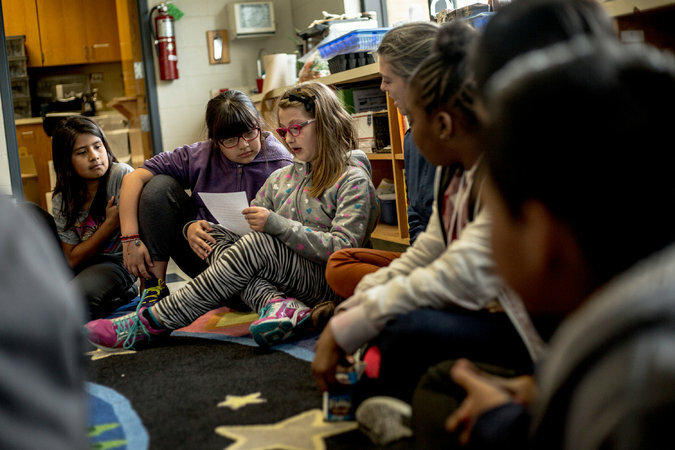 This environment reaps big dividends — attendance and test scores have soared in the community schools, while suspensions have plummeted. The district’s investment in science and math has paid off, too. According to Emily Lim, who runs Union’s STEM program, the district felt it was imperative to offer STEM classes to all students, not just those deemed gifted. In one class, I watched eighth graders create an orthotic brace for a child with cerebral palsy. The specs: The toe must be able to rise but cannot fall. 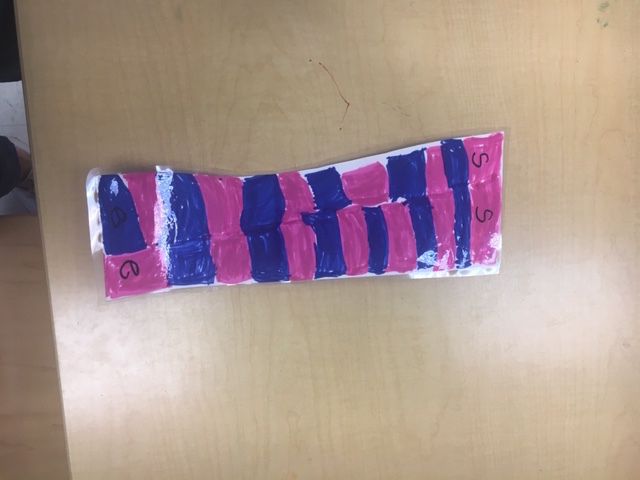 Using software that’s the industry standard, 20 students came up with designs and then plaster of Paris models of the brace. A fourth grader at Rosa Parks Elementary who had trouble reading and writing, for example, felt like a failure and sometimes vented his frustration with his fists. But he’s thriving in the STEM class. When the class designed vehicles to safely transport an egg, he went further than anybody else by giving his car doors that opened upward, turning it into a little Lamborghini. Such small victories have changed the way he behaves in class, his teacher said — he works harder and acts out much less. Superintendents and school boards often lust after the quick fix. The average urban school chief lasts around three years, and there’s no shortage of shamans promising to “disrupt” the status quo. The truth is that school systems improve not through flash and dazzle but by linking talented teachers, a challenging curriculum and engaged students. This is Union’s not-so-secret sauce: Start out with an academically solid foundation, then look for ways to keep getting better. 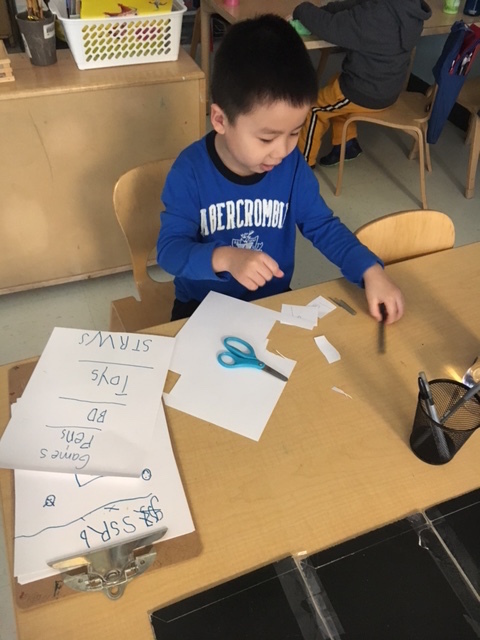 Union’s model begins with high-quality prekindergarten, which enrolls almost 80 percent of the 4-year-olds in the district. And it ends at the high school, which combines a collegiate atmosphere — lecture halls, student lounges and a cafeteria with nine food stations that dish up meals like fish tacos and pasta puttanesca — with the one-on-one attention that characterizes the district. Counselors work with the same students throughout high school, and because they know their students well, they can guide them through their next steps. For many, going to community college can be a leap into anonymity, and they flounder — the three-year graduation rate at Tulsa Community College, typical of most urban community colleges, is a miserable 14 percent. But Union’s college-in-high-school initiative enables students to start earning community college credits before they graduate, giving them a leg up. The evidence-based pregnancy-prevention program doesn’t lecture adolescents about chastity. Instead, by demonstrating that they have a real shot at success, it enables them to envision a future in which teenage pregnancy has no part. Under the radar, from Union City, N.J., and Montgomery County, Md., to Long Beach and Gardena, Calif., school systems with sizable numbers of students from poor families are doing great work. These ordinary districts took the time they needed to lay the groundwork for extraordinary results. Will Ms. DeVos and her education department appreciate the value of investing in high-quality public education and spread the word about school systems like Union? Or will the choice-and-vouchers ideology upstage the evidence? David L. Kirp is a professor at the University of California, Berkeley, a senior fellow at the Learning Policy Institute and a contributing opinion writer. 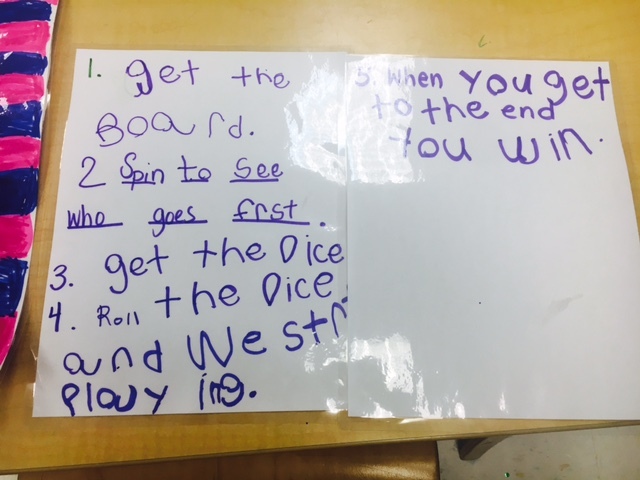 This entry was posted in Investigating Choice Time: Inquiry, Exploration, and Play on April 4, 2017 by Renee.